Today’s entry comes from John Daleske. This is a great article because setting up rain harvesting is a big “to do” on my list for next year. It seems like a simple thing to install. Capturing precious rain water will be critical in the future and important now for gardeners and permaculturists. It is also important as a back-up source for (mostly) potable water should there be a loss of one’s main water source. 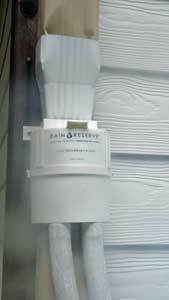 Rain Reserve makes a downspout diverter. I got a couple and have been testing them this past year. The design requires removing a downspout section, fitting the diverter in place, then screwing it in place. Installation requires a way to cut the downspout (metal snips or a saw), screwdriver, and a drill. It took me about an hour. As a closed system, it is supposed to keep mosquitoes and other water-loving critters out of the barrel. Rain water flows into the chamber. The center of the chamber has an upward extension with a hole at the top. Excess water and floatable debris flow out here. At the bottom of the chamber are the two outlets to which you connect the hoses. The two hoses are pressure fit, though you could add clamps. One hose runs to a barrel. I installed two 50-gallon barrels. The diverter input handles only the standard (American) downspout. All of my downspouts are the larger (6″), which required the reducer you see feeding into the diverter. That is an extra item, which I did not realize did not come in the kit. I am a little concerned that if we get a heavy rain for an extended period, the diverter would not be able to handle the excess flow, backing water up the downspout and eventually causing the gutters to overflow. 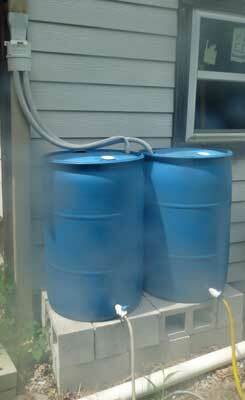 I wanted the barrels high enough to let me water my garden using drip irrigation. The base is loose stacked cement block, two blocks high, leveled to provide a sturdy platform. Note the sag in the feed hoses from the diverter to the barrels. There is no overflow pipe from the barrels. The intention is that the water fills up the barrel and up the hose at which point all other water fill flow out the center drain hole and down the downspout. The sag is caused by the weight of the water. Also note the crimping of the hose on the left. When installed, the hose lines seemed the right length and could not have been cut shorter. I am trying to decide on the best way to correct that crimp. The barrel curently still fills up. One of the main concerns I have is that this design does not handle debris wash from the roof to keep it from getting into the barrels. I have seen washer designs that collect the first few gallons from the roof, which will have the majority of small debris, then allow all subsequent water to fill the barrels. The other concern I have is that this seems like it would not do well in areas with lower rain fall amounts. It allows too much water to just flow directly to the exit, only capturing a percentage of the overall flow. For a small installation with just two barrels, it is an easy way to get started. For semi-arid or arid regions, I would look for a better way to capture a higher percentage of the flow.